Today was the official start to summer. It was fitting that it was in the 70s just yesterday and it was 94° today and it will be an absolutely miserable 96° tomorrow. With little more than a few hours' notice my least favorite season has begun! 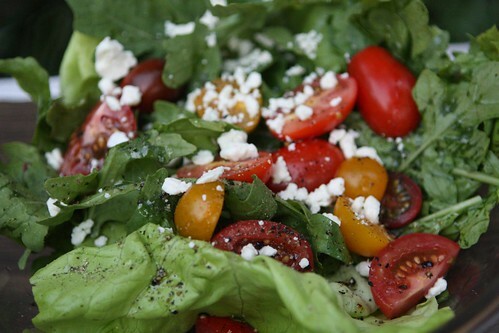 I made what might be a final attempt to woo Jen back to the world of salads today by using some of the farm green leaf, arugula, mixed tomatoes, feta, olive oil, salt, and pepper. It was a bust. I think I'm going to just freeze all the lettuce until after the babies are born. 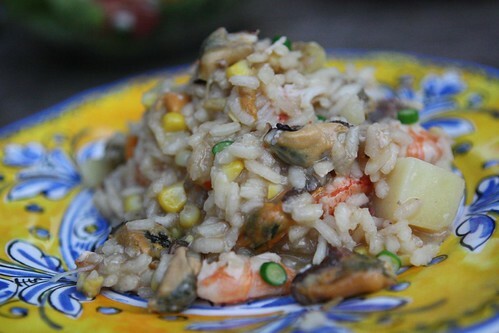 For a main course I turned last night's clambake leftovers into a tasty risotto. The only thing I added to the leftovers was arborio rice, butter, and garlic scapes. I didn't add any additional seasoning. I simply melted the butter, tossed the arborio in it, then slowly added the leftover clambake broth a little at a time along with diced andouille sausage. At the very end I tossed in some chopped potato, corn, shrimp, mussels, littlenecks, and lobster. This turned out remarkably well, added a minimal amount of heat to our already hot kitchen, and left enough for lunch tomorrow. I still have some leftover broth so now I need to figure out how I'm going to use it in the next couple of days without making something that will accentuate the miserable heat. Maybe I'll make seafood Popsicles! 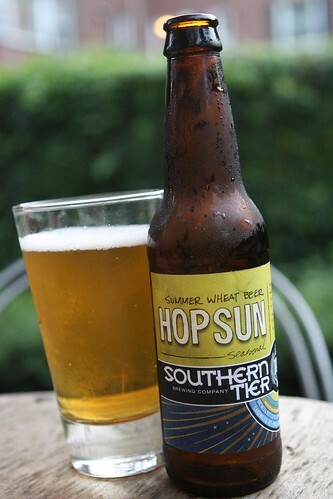 For beer I cracked open this Hop Sun Summer Wheat Beer from Southern Tier Brewing Company in Lakewood, New York. This was another citrusy, hoppy summer number that went over beautifully on this disgustingly hot and humid evening. Even though we didn't need to use the grill at all we set up shop outside to enjoy the evening while I greeted people I'd met on Craigslist to sell off our excess Ikea furniture. It was like a strange pot luck yard sale. At the end of dinner I had ten crisp dollar bills in my pocket. That's five dollars per babies' college fund.